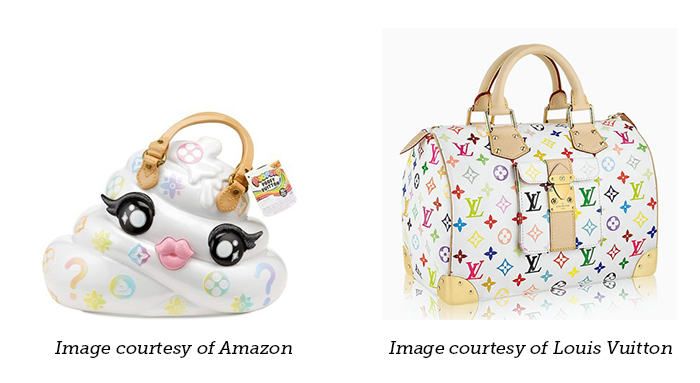 In December 2018 toy company MGA Entertainment Inc. filed a declaratory judgment against Louis Vuitton. This was to preempt the French fashion house from claiming MGA Entertainment’s Pooey Puitton toy was infringing a Louis Vuitton trademark. The Pooey Puitton toy is a hard case in the shape of the poop emoji that holds a surprise slim and unicorn food kit. It is targeted to children ages 5-10 and is sold on Amazon and at Target. It is not an expensive product and does not target the same consumers that would purchase a Louis Vuitton bag. It is even possible that MGA Entertainment’s children consumers would not even know that the toy is a parody on the famous Louis Vuitton monogram with a white background and multicolored LV’s. And yet MGA Entertainment filed a declaratory judgment against Louis Vuitton because MGA Entertainment knew Louis Vuitton would file a trademark infringement suit against them. A declaratory judgment is a litigation tool that allows a party to seek an official declaration from a court on the status of a matter in controversy. It can act like a “green light” from the court for a party to maintain the status quo. A declaratory judgment can be less expensive that a traditional trademark infringement suit because it cuts right to the issue. Does this item infringe the Louis Vuitton trademark? No matter what the answer, both parties would know that the outcome of any future trademark infringement suits regarding this product. Declaratory judgments are a useful tool to help build a brand and seek a determination that using a particular trademark will not infringe another’s trademark. In the fashion industry, declaratory judgements have been a useful litigation tool. For example, Forever 21 the fast fashion company and Adidas the athletic brand powerhouse have been involved in multiple lawsuits over confusingly similar uses of the Adidas three-stripes trademark. Each time Adidas brings suit against Forever 21 for trademark infringement. Specifically, Adidas has been going after any third-party using three stripes, arguing such use infringes its famous trademark. As part of this strategy Adidas has been going after Forever 21 since 2006. However, in March 2017 Forever 21 filed a declaratory judgment against Adidas stating they were not infringing the famous trademark in using three stripes on six specific clothing items. While this declaratory judgment was voluntarily dismissed and brought as a counterclaim in a prior filed suit between the two companies, it brought public attention to this on-going legal battle. Given how Louis Vuitton has acted in the past with parody cases, it is not surprising that MGA Entertainment sought a declaratory judgment. Louis Vuitton famously lost in the Haute Diggity Dog case where the court ruled the parody dog toys were not infringing the Louis Vuitton trademark and were fair use of the trademark. MGA Entertainment surely knew about Louis Vuitton’s history when making the decision to file the declaratory judgment. They could have waited to see if Louis Vuitton would file a suit and let the trademark infringement claims play out that way. But by filing the declaratory judgment, it helps show that MGA Entertainment is ready for a fight and to resolve this matter as quickly as possible. Declaratory judgments can be a good litigation strategy for a brewing trademark dispute. This litigation tool saves time and is more cost effective than a full trademark infringement action. The declaratory judgment will provide a full, binding result and acts sort of as a clearance for using the trademark that was in dispute. Contact WHIPgroup if you think filing a declaratory judgment makes sense for your company. Forever 21 Inc v. Adidas America Inc. et al, 2:17-cv-01752 (C.D. Cal. ).